In her latest exhibition, Museum – a place where works of art and objects of lasting interest are displayed, Portland based painter Sherrie Wolf continues to experiment with her practice of juxtaposing still life painting with a variety of references from art history. 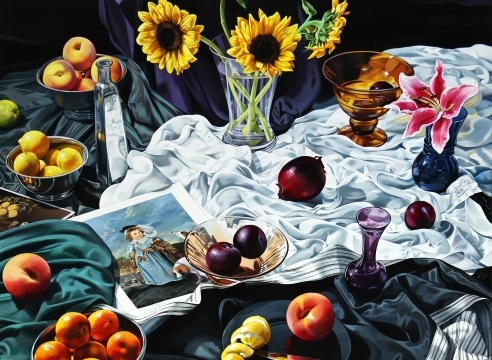 Well known for her exacting realism, Wolf continues in the still life tradition using a diverse array of fruits, flowers, bowls, and vases as anchors for her paintings. The numbers and variety of additional objets d’art in her compositions are increasing, and the range of patterns provided by drapery combine to make paintings that are kaleidoscopic in their visual impact. Art historical references remain, but they are integrated into the image as postcards or book illustrations. The dense layering and juxtaposition of objects and art historical imagery is an illustration of the museum-like collection of source material Wolf has acquired throughout her career. She continues to find fascination in these materials as they interact within and almost overflow from her canvases. Sherrie Wolf graduated from the Museum Art School, now the Pacific Northwest College of Art, Portland, OR, in 1974 and received an MA from the Chelsea College of Art in London, England in 1975. She began exhibiting her work in the mid 1970s while teaching art at PNCA. Her work is included in such collections as The Vivian and Gordon Gilkey Center for Graphic Arts, Portland Art Museum; Hallie Ford Museum, Salem, OR; the Tacoma Art Museum, Washington; City of Seattle; and Washington State Art Collection. Wolf has also been included in multiple curated group exhibitions across the country. In 2012,Wolf’s work was presented in a solo exhibition at Northern Arizona University in Flagstaff, and earlier in 2014 she was featured in a solo show at the Long Beach Museum of Art in Southern California.